When my husband and I were dating, one of our favorite meals was fondue, especially dessert fondue. It’s so romantic, and the way you enjoy fondue makes you slow down and enjoy your meal, conversation and just being together. Now that we have a kid, our favorite thing is still fondue, because my son loves it so much! And what kid wouldn’t like dipping their foods in cheesy goodness? Kids love cheese! 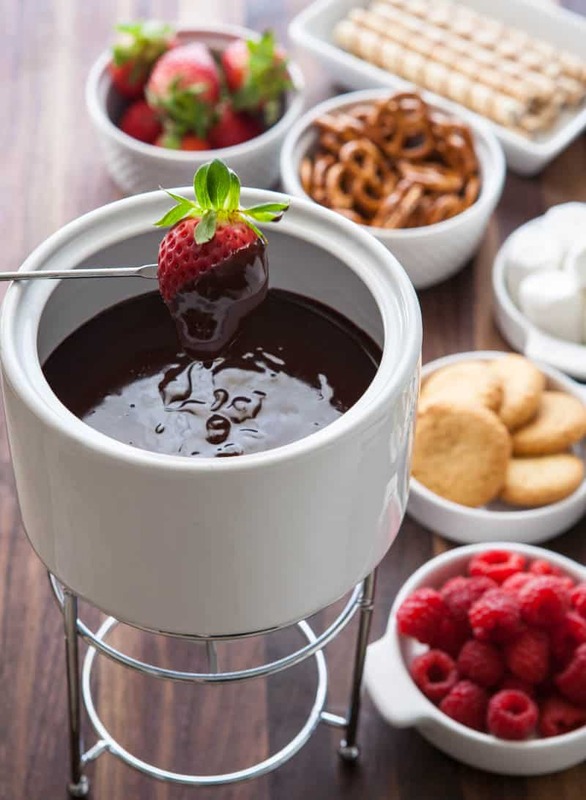 So on our family game nights, we often enjoy a cheese fondue followed with a creamy dark chocolate dessert fondue. I cut up lots of veggies for our meal paired with bits of ham. And for dessert I serve lots of fresh fruit. It makes for a very healthy, filling meal that we all enjoy so much. 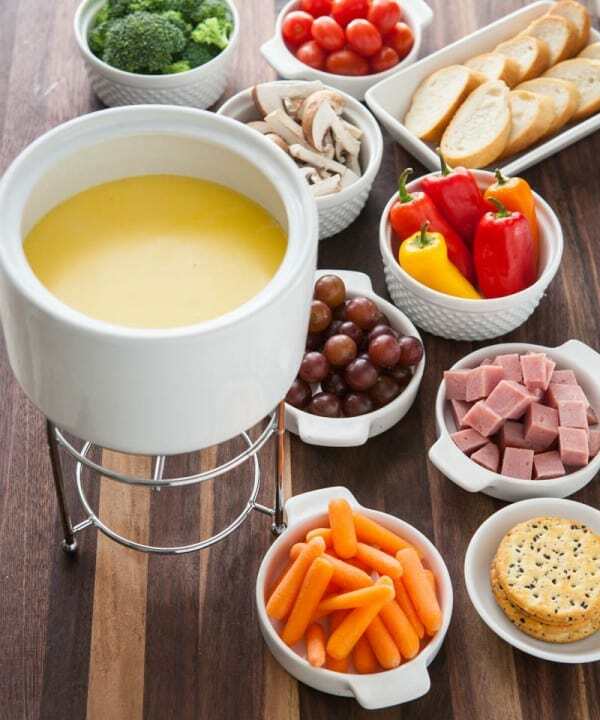 Oh my gosh – this takes me back to my childhood when fondue was just becoming popular. My parents would break out the bread and cheese on Fridays! But they never did dessert. That melted chocolate! So awesome! I love fondue too! And so do my kids, but I have to confess that we don’t do fondue often enough at all — can’t wait to read your KA post on it. I love fondue. We have a fountain and we also do it old school as well. I’m a bit of a germophobe so I prefer everyone has their own pot, not even kidding. It’s so weird. I think my favourite combo is chocolate and banana. Heavenly. Chocolate and Banana is so good! I’ve only done fondue a couple of times but oh my goodness we loved it! Do you ever do the oil/meat fondue? I’ve never done the oil or broth fondue, but we did do cooking meat on a hot stone at a fondue restaurant here locally. I was so impatient, and the stone kept losing heat, it was making me crazy, lol. My family LOVES fondue nights! A cheese and a chocolate course are a must. I love fondue and I definitely don’t do it enough! This makes me want to break out my pot! I remember the first time trying it as a kid and just loving it. Love doing Fondue at home!!! We have a fondue pot that we have never used – I think it is time to break it out! I just got a fondue pot but I haven’t tried dessert fondue yet, can’t wait to check out your recipe!